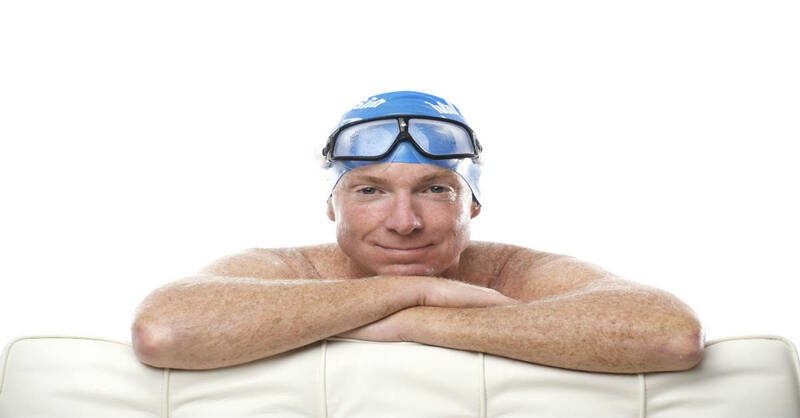 On July 10, I had the pleasure of experiencing all my favorite aspects of swimming in just a bit over 20 minutes—perhaps the most concentrated swimming enjoyment I’ve had in 50 years. The occasion was the inaugural Mystic Sharkfest. (Several people recoiled when I told them the name of the event: Did it involve swimming with sharks?). Last spring. my good friend Amby Burfoot, told me he planned to swim his first open water race in 68 years and invited me to join him. He said his cherished goal was to finish last. (Read Amby’s entertaining account. 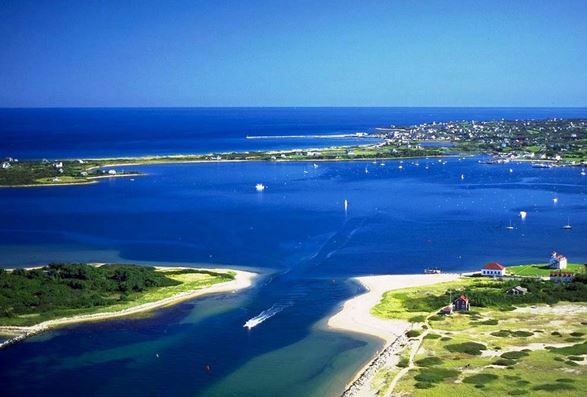 )Amby grew up in nearby Groton-Long Point, a peninsula surrounded on three sides by water and spent countless hours enjoying Long Island Sound as a boy. At 14 he discovered a love for running long distances, went on to win the Boston Marathon in 1968 and to become perhaps the world’s most respected voice on running for speed, fitness, or pure pleasure as editor-in-chief of Runner’s World magazine. After turning 60, he came to me for TI instruction, to enjoy swimming more and for a low-impact activity to extend his enjoyment of running for decades more. Mystic is of course best-known for Mystic Seaport, its famed whaling museum, but the entire town is a well-maintained display of the prosperity of the whaling industry during the 19th Century, and the beautifully designed homes and commercial buildings one sees is old whaling towns. I’d only been there twice before—some 50 years earlier when my sea-loving dad took our family to visit the Seaport and 20-odd years later when I reprised the visit with my own children. Both times we drove directly from I-95 to the museum so I’d not had the opportunity to fully appreciate what a felicitous place Mystic village is. This time, with Amby, his wife Cristina, and sister Natalie as my guides, I got to know the place especially well and look forward to returning soon. Second, I love to directly experience nature as I swim. Third I love to swim from one place to another. And most of all to have the swim itself be part of a memorable overall experience. The Sharkfest was all of that. 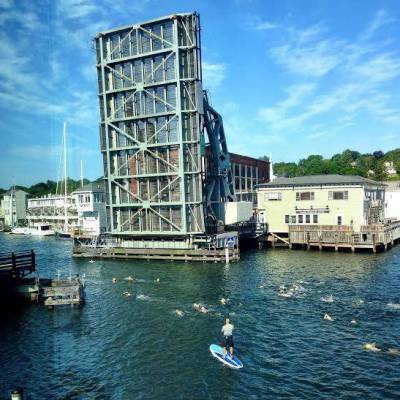 We started from the historic whaling vessel Charles W. Morgan, the showpiece of the Seaport Museum, then swam down the narrow and winding course of the Mystic River toward the center of the village, and its famed Bascule Drawbridge—which was raised as we passed under it. The confines of the course kept the field closely packed so I had company—someone to race with—every moment. At the finish, the restaurant Red 36 hosted an open air party with a bagel breakfast—and beer if you wanted it that early. (I didn’t.) Because of timing problems, when race director Dave Horning announced the award winners, my name didn’t appear among the top 3 in the 60-64 age group. A great weekend in a beautiful historic town with good friends. A brisk swim with 150 other open water enthusiasts, on the most scenic course of any event I’ve swum in the 42 years since my first open water race. And an age group win. Just the kind of swimming experience, I hope I may continue having until age 95. What was additionally satisfying was to see that I could still finish quite respectably despite having done little or no swimming for over seven months, from Sept 1 to April 20, and averaging only 2000 meters per practice since then. You can see the high-efficiency training program I followed from April 20 to June 20 here, and the similar program I’m following this summer here. 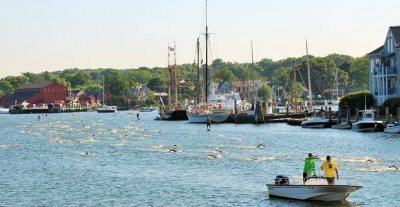 My next scheduled event (though I may enter another race between now and then) is the inaugural 1500-meter Great Salt Pond Swim, sponsored by TI, on Block Island Aug 15. We’ll conduct an open water clinic from 4 to 5:30 pm on Aug 14. Congratulations on Sharkfest! 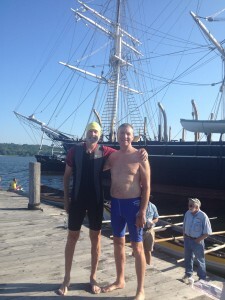 On the same day, Andrew Baer and I swam from the Naval War College in Newport to Jamestown in the 39th annual Save the Bay swim. Veteran swimmers agreed it was the most difficult swim in recent memories due to strong outgoing tides. It was our longest open-water swim yet — 2 miles, and we could not have done it without TI and our expert coaching from Cathy Adams! I wish we could participate in the Great Salt Pond Swim, but we will be doing the Timberman Half-Ironman that weekend. Maybe next year we can convince you to join us in Save the Bay! I’ve joined your TI training since last November in Albuquerque, NM at the age of 59. I can swim 1 lap now but dream that someday I can join you on 1500 m open water. Thank you for inspiring me. You look like you’ve dropped about 25–30 pounds. Have you been ill or did you just decide to lose some weight. If the latter, any tips?? ?–I am finding it very difficult to lose those last stubborn 20 pounds. Oh, my goodness, Terry! I wish I had known because I would have certainly been there to follow you and greet you at R36 for your finish. I live in Mystic and took lessons from one of your TI Coaches right here in my pool. As a child and teen, I lived in the water and swam “effortlessly” every night, sometimes up to 100 laps, until my mother dragged me out to send me to bed. But then as an adult (not to mention former smoker), swimming became so difficult for me. I was never able to tap into that “effortless” swim I had experienced when young. When my husband and I finally decided to put a pool in our backyard, I was determined to swim my laps yet again. And that’s when I discovered you and TI Swimming. I still struggle with it, but you are my inspiration. Thank you for all that you do to spread the word and make fishlike swimming possible for us all. Perhaps one day I will meet you for lessons/coaching or even join you for the Mystic Sharkfest if you return next year. Hey Terry, Dan here, i just learned about the Sharkfest events a few weeks ago Mmyself and was signed up to swim the (1.5 mi) liberty sharkfest from the statue of liberty up the NJ side past Ellis Island and the famed Colgate clock ending in the also historic Morris canal (marina). Unfortunately the event was cancelled due to weather and safety concerns but I have a credit for any other sharkfest swim. Three cool things about this event that capture some of the reasons you mention for loving open water swimming; you start and pass lots of historic locales, you get a spectacular view of the lower Manhattan skyline and best of all, you start by jumping off a ferry just off the Staure of Liberty! Would recommmemd this next year, ill be there! Also, check out some great swims in the NYC area with a group out of Coney Island, they do a very limited (8 people max) swim from Sandy Hook, NJ to Breezy Pt, NY. Its about 10 miles. They are CIBBOWS.org. Ps, the great salt pond swim sounds fun, would love to try it but will be in Italy this August, any swims there youd recommend? Ill look to do some in Lake Como and the Adriatic, near Pescara. I have experienced a break through this morning in my 30 mn early swim : 2 strokes less! And i was swimming so slowly, not sinking!!! Thanks to watch yr DVD and dreaming allnight about my next swim!! Thanks Terry and Claire Owen my coach in Australia and NCIE pool that is so warm and delicious at 6 am!!! Thanks for recommendation on Libety Island event. I’m thinking of Newport RI Sharkfest on Sept 20. I’m a CIBBOWS member and have done many of their swims. Thinking of doing a members-only swim Oct 3, Breezy Point to Brighton Beach. Third week of Oct, I plan to swim Corsica to Sardinia with Lennart Larsson of Sweden and Tommi Patilla of Finland. We will swim TI In Synch as we did in Oct 2013 across Gibraltar Strait. Who was the TI Coach who came to your home? I have lost 30 lbs (actually 40 from my all-time peak weight of 224. I’m now at 184, lower than I’ve been in 30+ years. How? I stopped trying to eat low-fat and have focused on low-sugar instead. Been working on it for nearly 15 years but got more serious this year. I turn 65 next year and want to be the same weight I was in college — below 170. Binh I will do a workshop in Santa Fe Oct 10. I hope you can join us there. It’s great to hear from you. I’m sorry we won’t get to reconnect at GSP, but I’m sure you’ll have a grand day at Timberman. Swimming is very inspiring! I have never taken long swims in the open water, but this is my dream. For now I have just prepared a special swimwear from http://www.proswimwear.co.uk. Hope it will be another incentive for me to take a big swim! So Terry, nice article, BUT, you never mention what happened with your friend, Amby Burfoot? How did he do in this “race”? I thought that was going to be the point of your blog…keep moving, who cares where you finish, and anyone can learn the TI method, etc. Of course congratulations to you and your finish, but I really want to know how a beginner faired? As a formER competitive swimmer, getting out of the pool and into open water scares me to death! How did he overcome that fear? Thanks for any information. Amby finished 5th from last and in enormous good humor. However, you should really read Amby’s highly entertaining account to which I linked in my post.